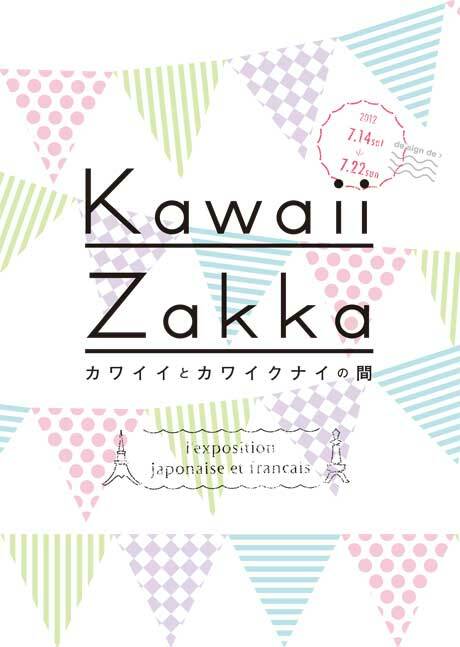 Kawaii Zakka Exhibition is traveling from Paris to Osaka! The exhibition will take place from July 14th to 22th in Nakanoshima Design Museum, de sign de>. 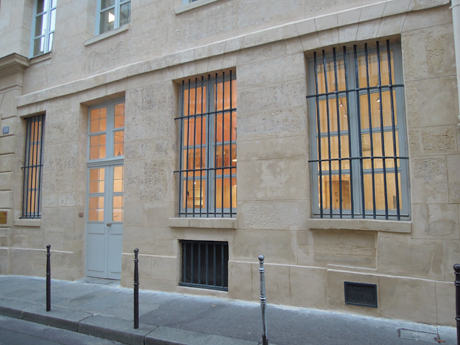 The creators who participated in the exhibition in Paris will present their works in July. 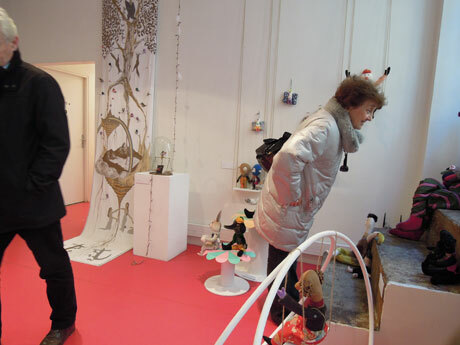 Also, there will be a new designer in the show; she is a French product designer, Marie-Aurore Stiker-Metral. She is currently staying in Osaka in the same exchange program I was in to be in Paris. 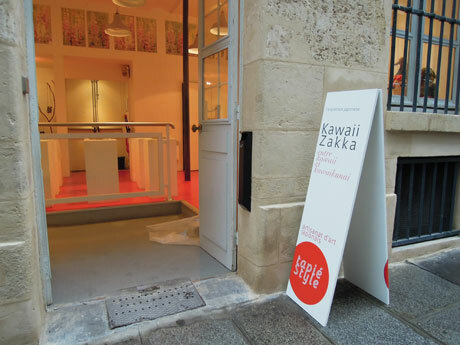 We presented “Kawaii Zakka” in Paris. “Kawaii” is already a popular category of Japanese products in Europe. As for “Zakka”, because it is not a known word in outside of Japan, I made a challenge to re-define it in a slightly different meaning from its Japanese connotations. a hand-made product, which is neither “art” nor “traditional crafts”. 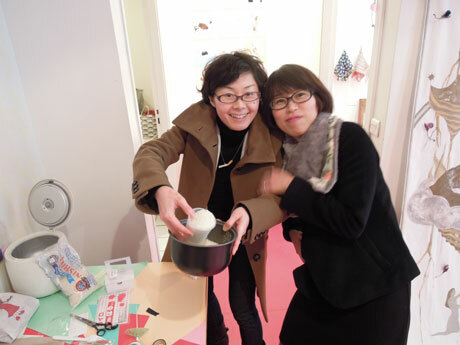 a hand-made product that today’s Japanese people feel an aesthetic sympathy to. There seems a developing culture of “Kawaii Zakka” in Kansai area (western part of Japan around Osaka). There are many creators and also people who support them. The aim of this Osaka exhibition is to establish the “Kawaii Zakka” culture here and present it to the outside of this region in a more concrete form. 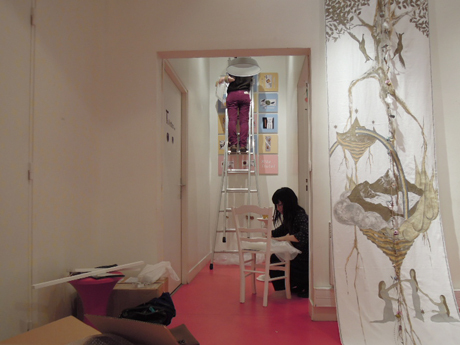 We are planning many events in the beginning of this exhibition. Please visit our blog for more detailed information. 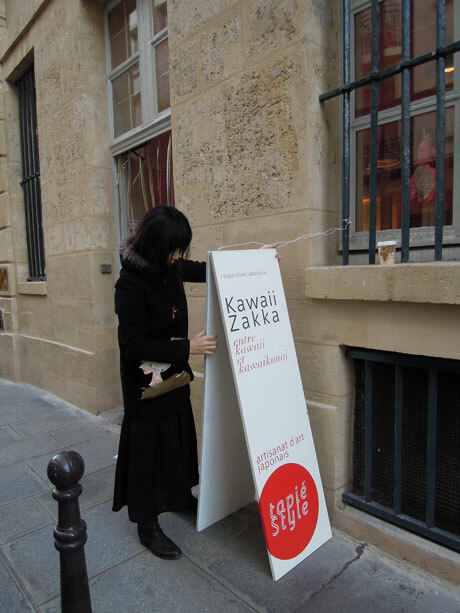 ” l’exposition Kawaii Zakka ” was held in Paris from January 5th to 14th this year on the purpose of introducing Japanese artists in France. Now this exhibition has come to Osaka! Please stop by if you are around. 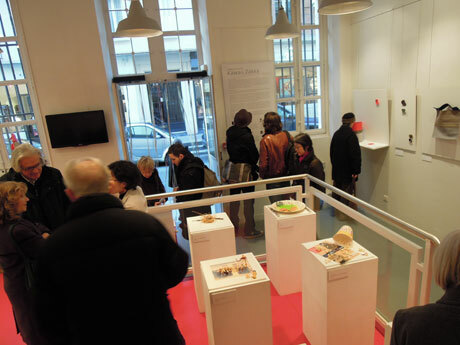 Tapie’s first exhibition in the overseas has finished on January 14th, 2012, at 18pm. 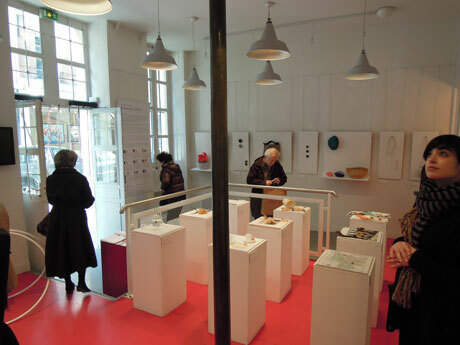 This 10day exhibition has received about 300 people from France, Japan, India, Italy and Swiss. and the people at City of Osaka office. The exhibition would not have been a success without these peoples heart warming support and advises. 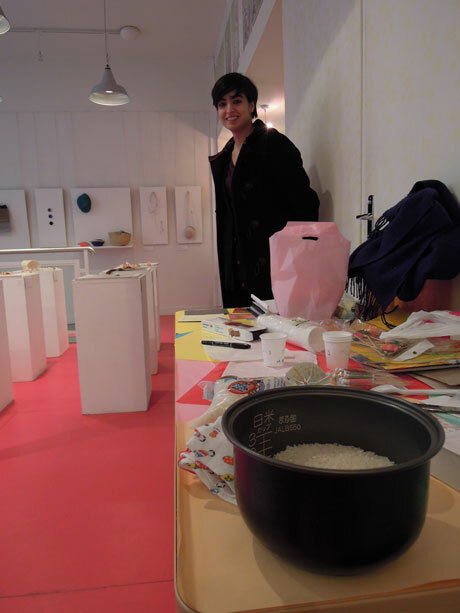 Throughout the exhibition, I received many comments both very nice and severe, all of which were so valuable. All the advises will be the nourishment for the future and I will go forward with them. My sincere appreciations to every person who were related to this and every moment shared with everyone. 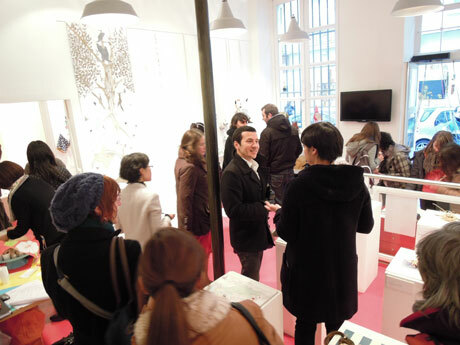 In two days, including the opening party, about 100 people came to see the show. You can see the enlarged pictures when you click on the photos above. 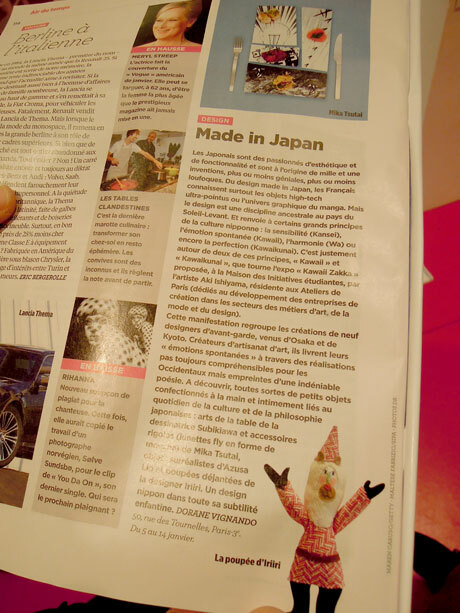 A famous news magazine “Le Nouvel Observateur” featured the exhibition on their current issue. Quite a lot of people are coming to see the show by reading this article. 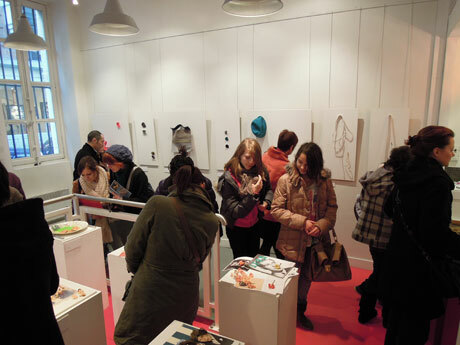 The exhibition will go on till the 14th of January! 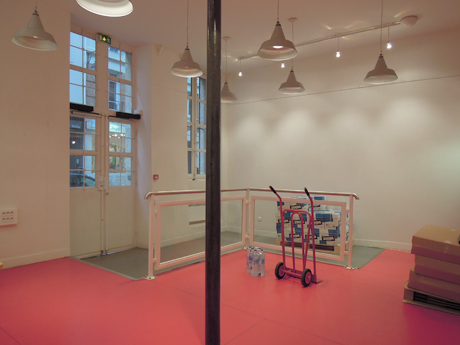 The exhibition will start tomorrow (8.5 hour later, to be exact). Installation tomorrow and day after tomorrow, at last. Are you having a good new year’s holiday? 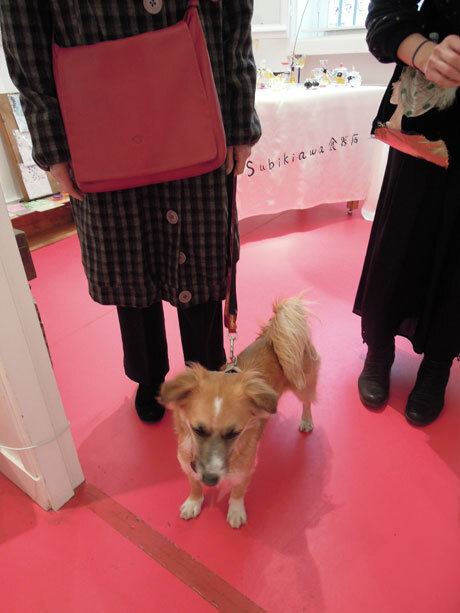 Today, Subikiawa glassware store, one of the artists for the exhibition arrived at Paris. 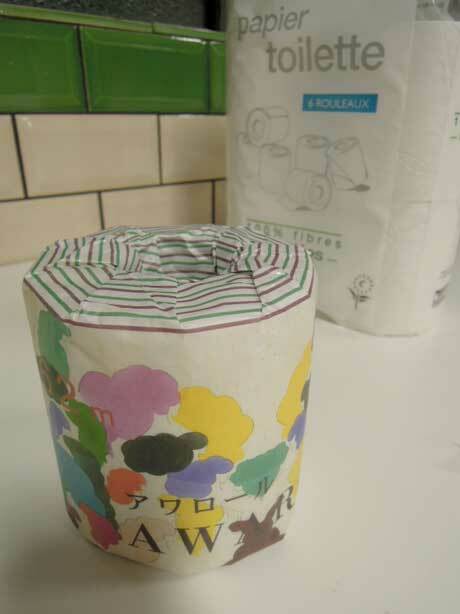 She made her signature product “awe roll” with Paris toilet paper. We’ll be working hard for the preparation tomorrow. Wish you the happiest new 2012 ! 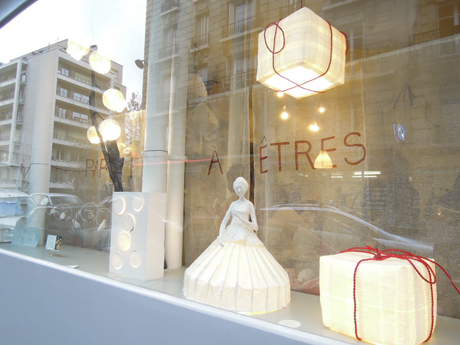 I visited the atelier / gallery of Papier à êtres. They use the technique of paper mache (papier-mâché) to create their artworks. Most of their works are made with white paper and when there is light inside, there is a dreamy atmosphere in the space. It was beautiful to see how the light and shadow add a much richer expression to the pieces. 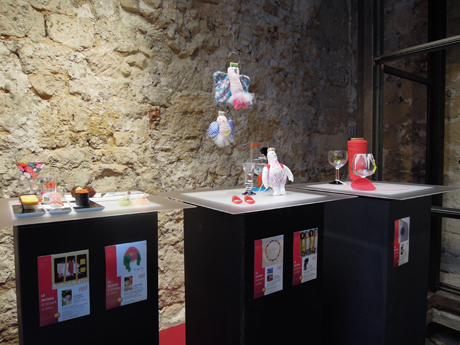 Their works were exhibited in Opéra Garnier and are now also sold in the store there. 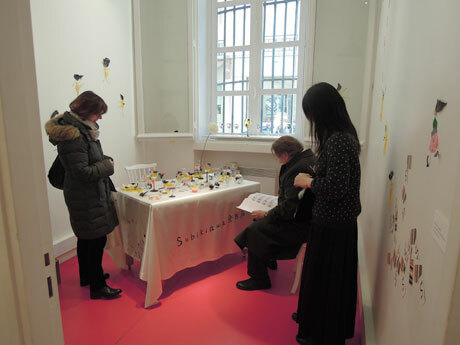 You can find the photos from the exhibition from here. 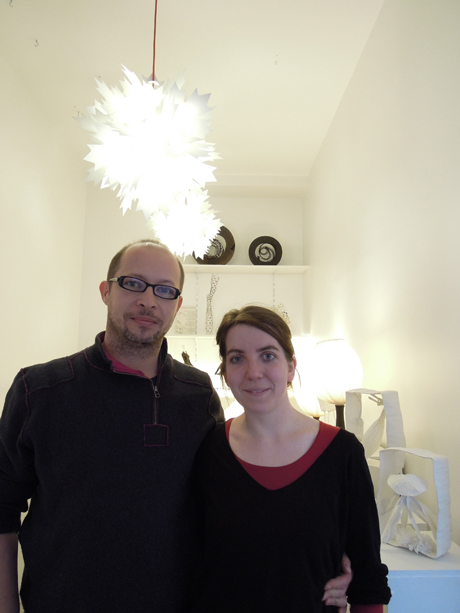 Here is the artists, Sophie Mouton-Perrat and Frédéric Guibrunet. They both had been working as a paper object artist for more than 10 years before they started working together 4 years ago. 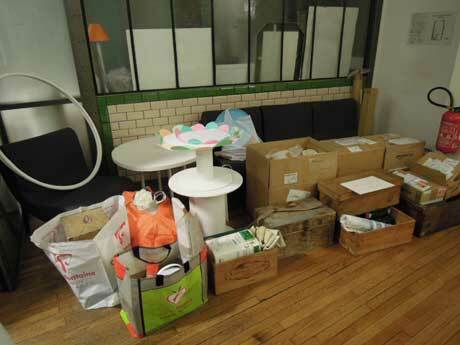 Although their group work history is not long, the atelier is full of made-to-order objects. 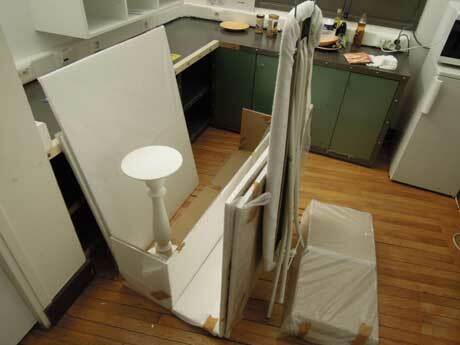 Their works have a sense of ephemerality which made the object even more beautiful and attractive. Looking forward to seeing their future developments. 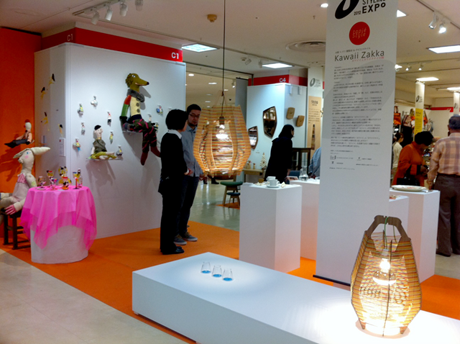 It’s now become a while ago… but there was a sample exhibition of “Exposition KAWAII ZAKKA” from November 20th to 26th. 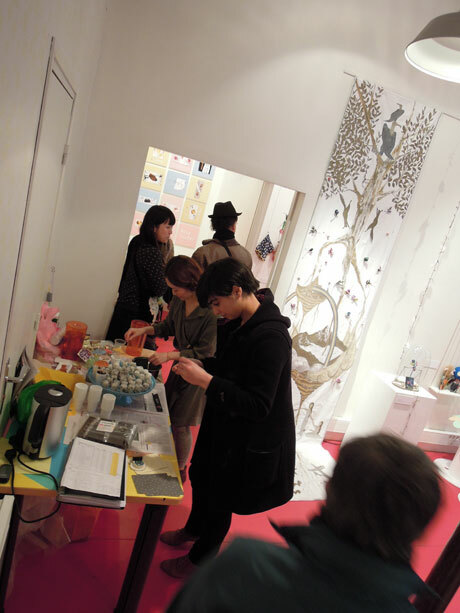 The exhibition was a part of “Salon Idees Japon” held in a gallery “ESPACE CINKO” in Passafe Choiseul near Opera metro station. Osaka city had a booth in this exhibition so they gave me a small space for the advertisement of the coming-up exhibition. 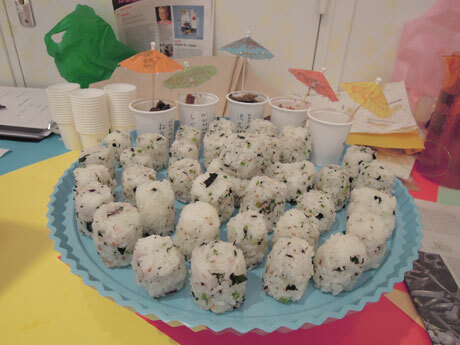 In France, things that “look Japanese” tend to receive a lot of attention from customers. 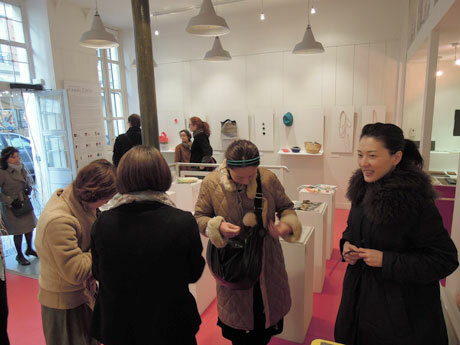 I met a few French jewelry designers who make their products with Japanese folding paper techniques as well. On the other hand, there were people who do not consider if the product is “Japanese-like” or “not Japanese-like”, and just enjoy them as they are. Some of the viewers gave me a comment that they were “mignon (=cute)”, “funny” or “interesting”. It was a great opportunity to get a glimpse of the taste of French people. Here it is !! The gallery is finally set. It looks like the photos from out / inside. 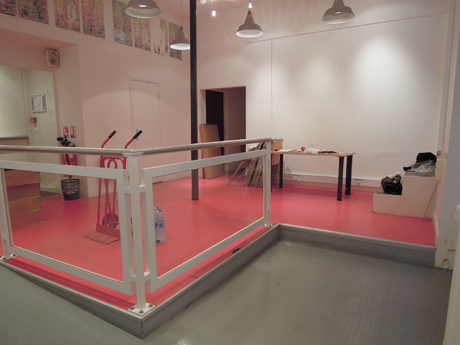 It has a high ceiling and bright red floor. The exhibition will be in next January and I’ll keep you updated with the preparation process as well. Any supportive comments / advice are appreciated. Also, if you could stop by at the exhibition, it would be awesome!